Where better to get an authentic flavour of Falmouth than right on the water? 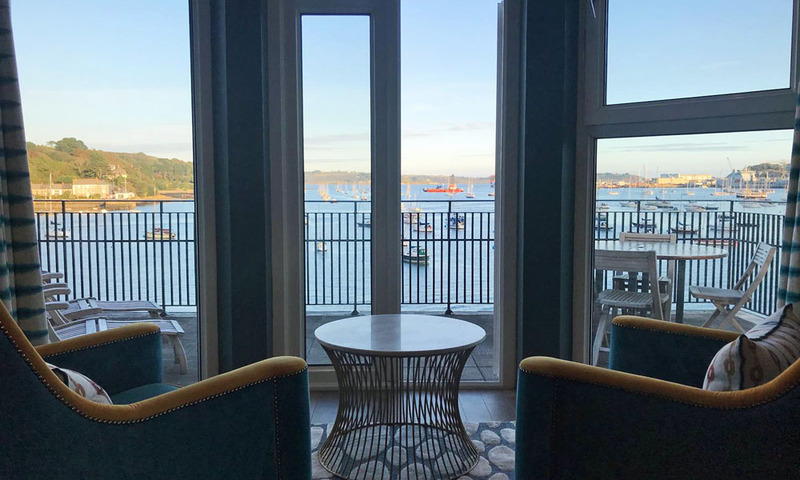 The Greenbank Hotel and Water’s Edge Restaurant occupy prime position, perched on the historic harbour, with jaw-dropping views across the Fal estuary to Flushing. In fact, with its own pontoon and moorings, you can even make the journey here by boat. 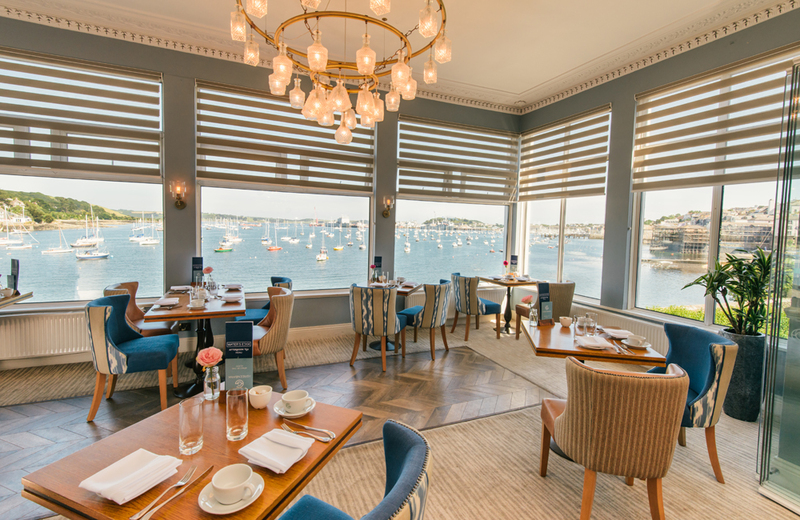 One of Cornwall’s oldest hotels, maritime heritage meets modern elegance at the 4-star Greenbank Hotel in Falmouth. 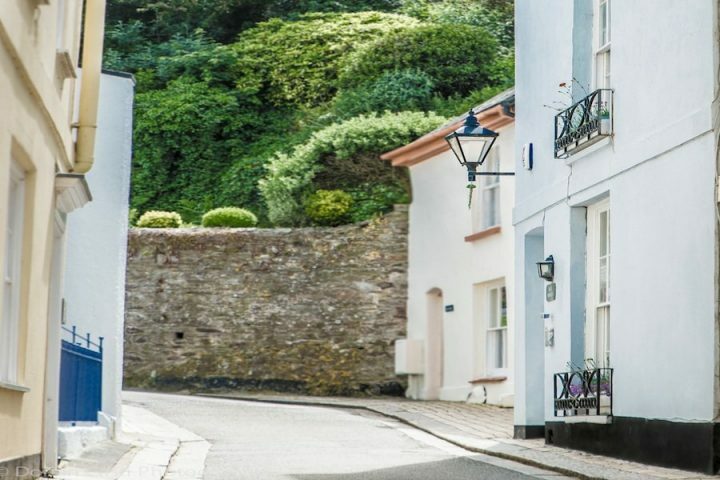 It’s a perfect place to base yourself to explore the harbour town and local area, with a wide choice of comfortable bedrooms and suites, some of which welcome families and dogs. 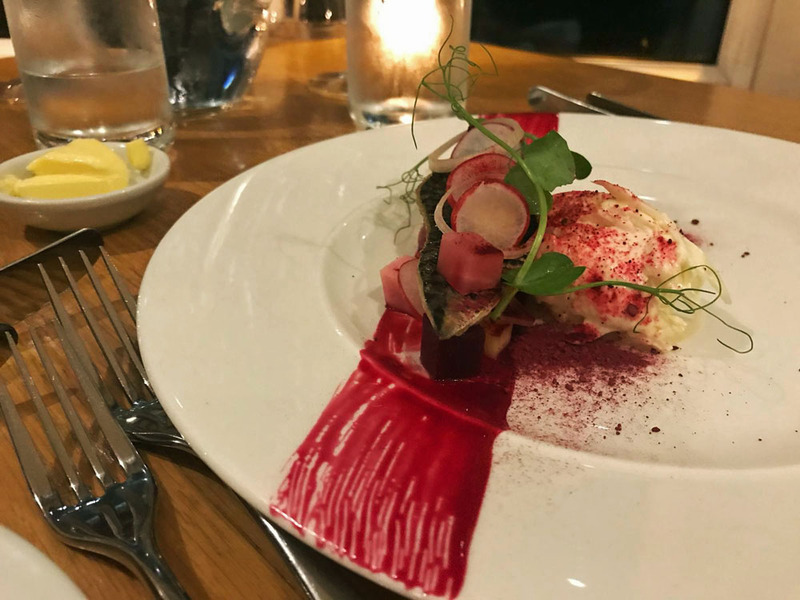 And though Falmouth is chock-full of hip bars and eateries, there’s really no need to leave the hotel for food, as there’s a 2 AA Rosette restaurant and pub right here. 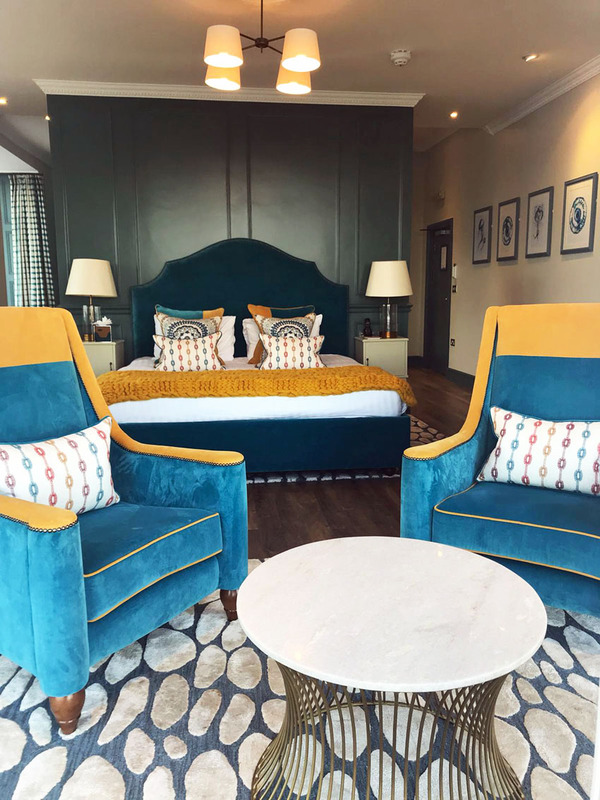 We stayed in one of two luxury suites at The Greenbank, The Florence Suite, recently redesigned by Matt Hulme and renamed in tribute to famous guest Florence Nightingale. 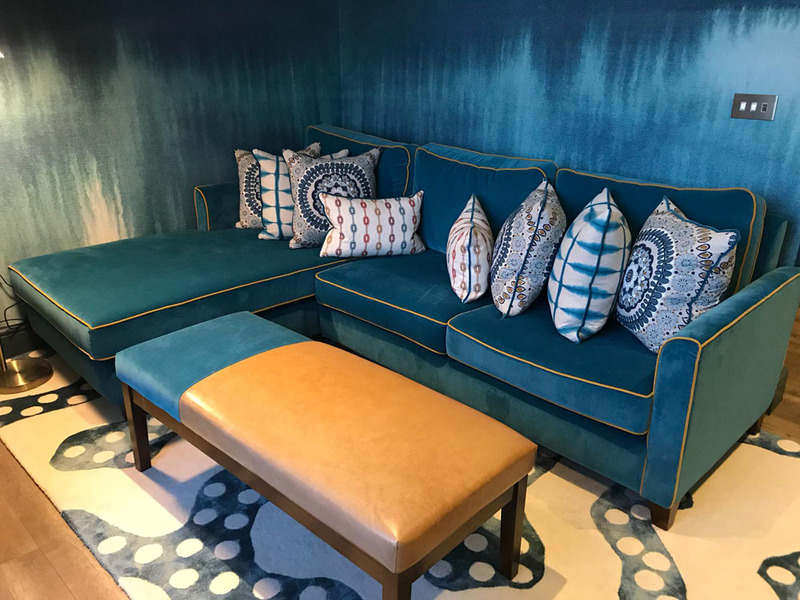 Matt’s inspiration for the room was seeing ‘flashes of sunlight bouncing off the waves in the harbour’ at sunset and this is evident in the sumptuous sea blues, teals and touches of mustard and yellow in the room. The location has clearly influenced the room, seen in the Pendennis Point pattern in the stunning bespoke wallpaper and in the watercolour prints commissioned for the room, but the nautical theme is not overdone and the overall effect is really fresh and contemporary. Not long after we had settled in the room a call came from reception to check that we were happy and had everything we needed, just one example of the standard of service we received throughout. The suite is beautiful and very spacious with a separate lounge area but the things that immediately strike you are the incredible panoramic views and beautiful natural light that floods the room through the three bay windows. There is a large private balcony with views of the harbour and across to Flushing. You can pick from loungers and outside table or chairs or sit in the comfortable armchairs inside the largest if the bay windows and still enjoy the uninterrupted views. 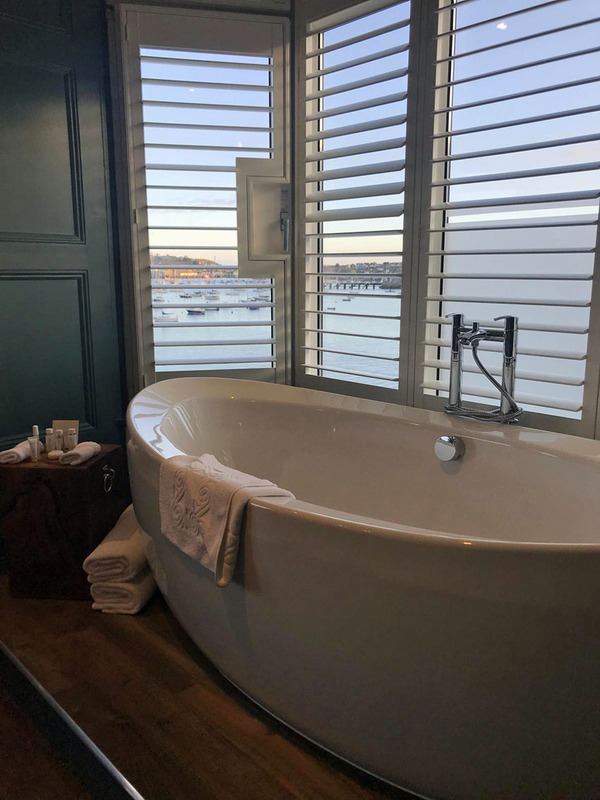 You can also enjoy the views from the roll top bath which sits in one of the windows with shutters which allow you to soak in privacy while watching boats bobbing around in the harbour. White Company toiletries are provided here and in the large walk in shower in the bathroom (including relaxing sleep spray but we needed no help to drift off in the super comfy king size bed after our meal in the Water’s Edge Restaurant!). 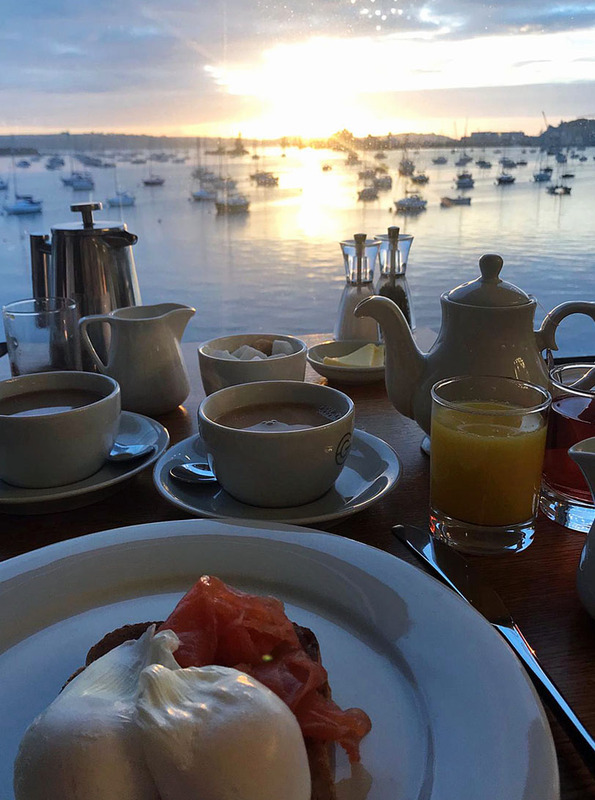 My favourite part of our stay in the room was in the morning, opening the curtains and throwing the doors open before retreating back to bed with a cup of (Cornish) tea to watch the sunrise. Kieran had to make a few business calls first thing but the suite was so spacious that he could do that from the separate lounge area and not disturb my reverie. Before our meal we chose to have a drink in the refurbished bar area while we perused the menu beneath the amazing chandeliers. Unfortunately visiting at 8 months pregnant meant I couldn’t take advantage of one of the most extensive and imaginative cocktail lists I’ve seen locally (2 for £10, so I’ll be back!) but luckily there were some interesting mocktails too and the spiced seedlip with orange and cinnamon got me in the right mood to sample Executive Chef Nick Hodges’ new Autumn/Winter menu. 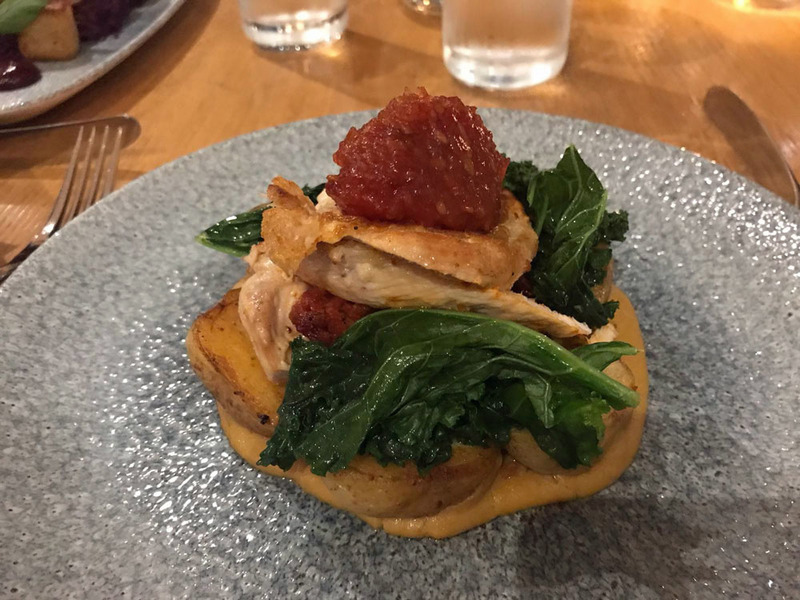 We were very lucky to be the first to try the new Autumn/Winter menu created by Nick and his team whose ethos is to ‘bring local produce to life, with imagination and creativity’. 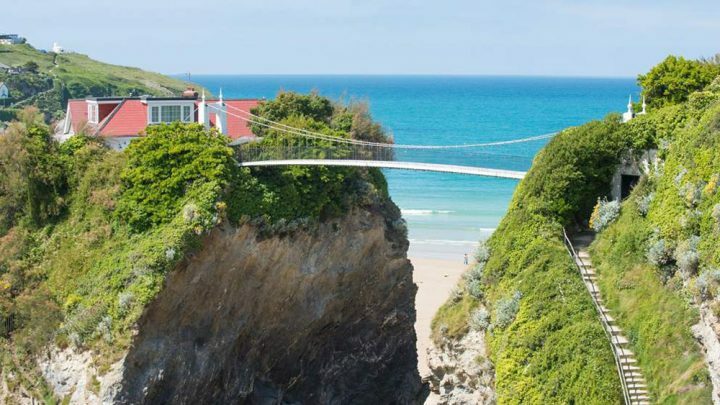 The menu and restaurant itself both offer relaxed fine dining and the focus of both is the sea, both in the celebration of fresh seafood and the water lapping right outside the restaurant beyond the private pontoon. The long narrow restaurant means most tables have uninterrupted views of the harbour, still special even after dark. Despite a 400 year history the redesigned restaurant is modern but cosy and is a relaxing space where you can savour the views and the fabulous food. We had a tough time choosing our starters, tempted by nearly all of them, including cold smoked wood pigeon and smoked haddock oyster chowder. In the end we were very happy with the tasty dishes we settled on. I chose local mackerel with pickled shaved radish, beets, shallots and horseradish remoulade. 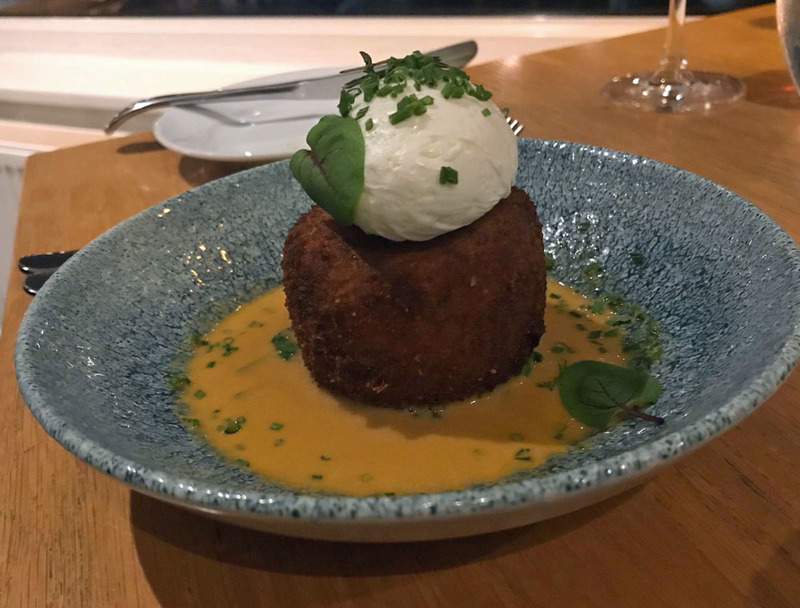 Kieran chose the Cornish crab fish cake which was served with with a soft poached hens egg, wilted spinach and crab emulsion. Looking out across the sea we nearly chose more seafood for our main courses, tempted by the monkfish curry and Granny Alice’s Fish Pie, but ultimately I chose the oven baked chicken breast – this was served with chorizo farce, smoked corn puree, sauteed potatoes, wilted greens and bacon jam. 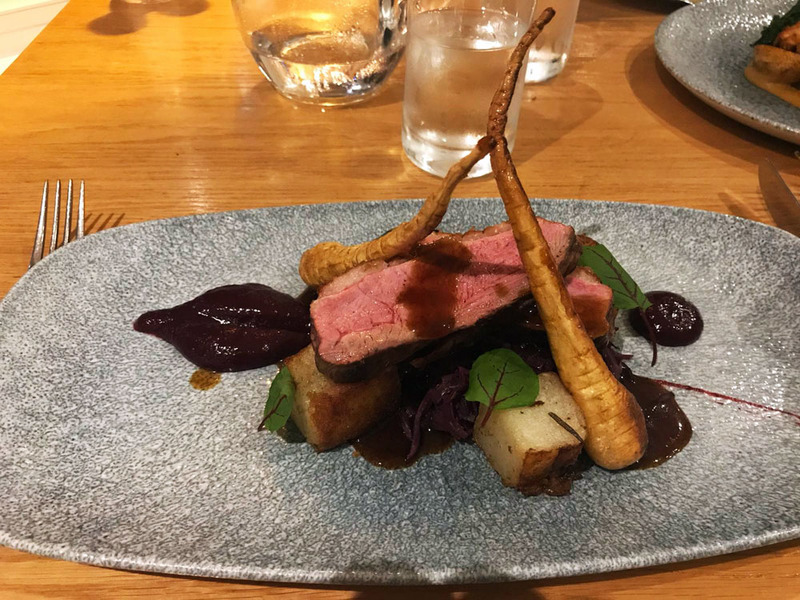 Kieran’s choice was the pan roasted creedy carver duck breast with fondant potato, spiced red cabbage, piccolo parsnip, cherry gel and honey port jus. In the interests of research I obviously tried this too and both dishes were delicious. For dessert I plumped for the very yummy chef’s crumble – a winter fruit compote with cinnamon crumble, blackberry gel and clotted cream. 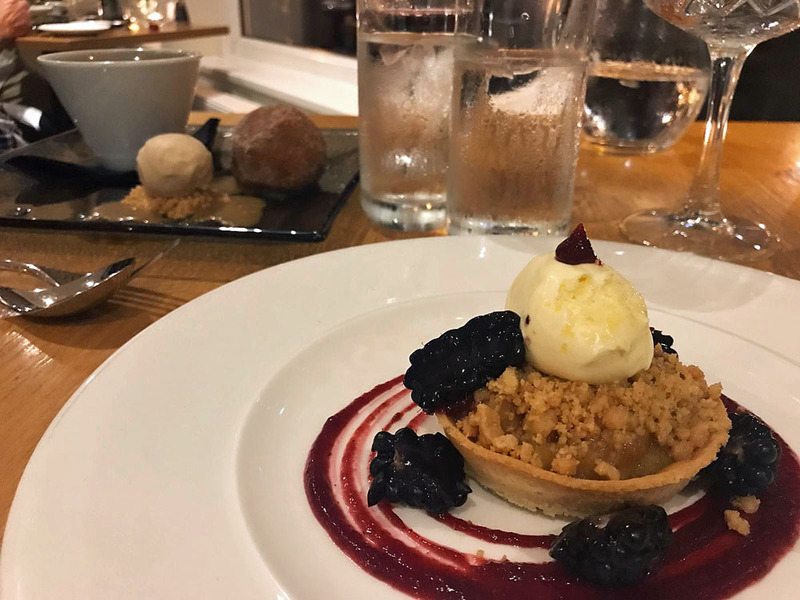 Kieran was pretty pleased with his choice of toffee apple brulee with salted caramel textures – I think mainly because it came with an apple doughnut on the side! The Water’s Edge is not the place for fish and chips or a quick bite but if that’s what you’re in the mood for you won’t have to go far with The Working Boat pub directly beneath you. 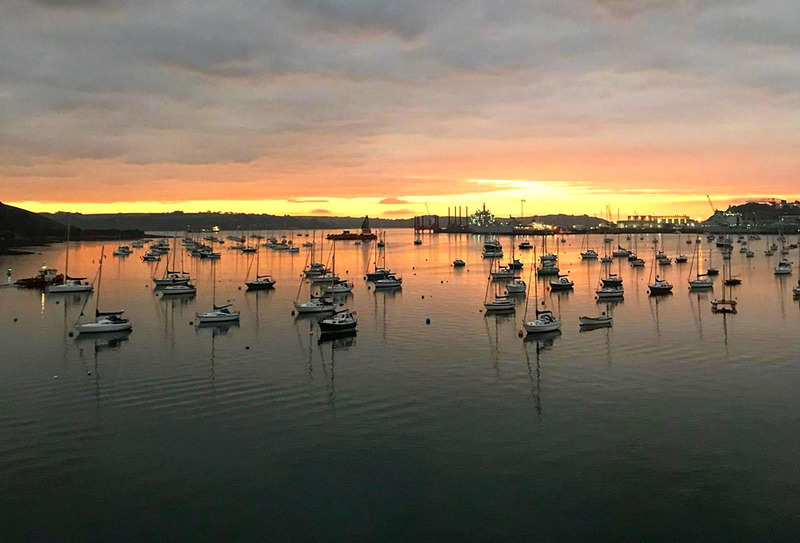 Good for: An elegant base from which to explore the bustling seaside town of Falmouth and enjoy a relaxing break by the water. 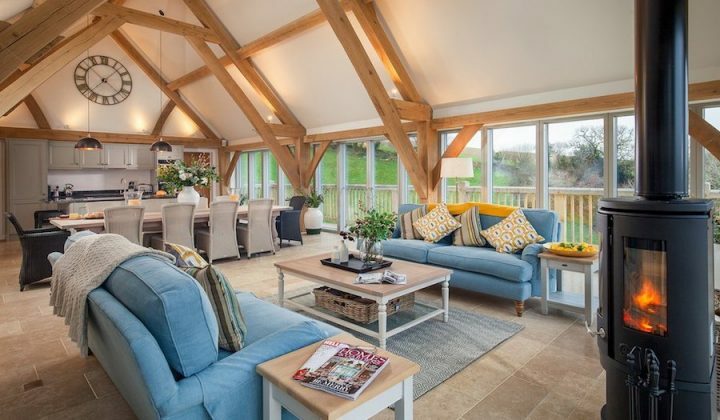 Not for: Anyone who prefers a countryside location (though you’re not far away).